Gray leaf spot (Figure 1a) continues to be a concern in many fields. Some people are reporting increasing severity and development of new gray leaf spot lesions after foliar fungicide applications. Learn how to identify and manage corn diseases at the Aug. 27 Crop Management Diagnostic Clinic near Mead. Among the speakers will be UNL Plant Pathologists Tamra Jackson-Ziems (corn) and Loren Giesler (soybean). Register today. Keep in mind that there are a few scenarios possible in these fields. A number of bacterial diseases are common in corn across the state. Some of these diseases may look similar to other fungal diseases, like gray leaf spot. They will be unaffected by foliar fungicide applications and may still be increasing in severity. In addition, it's important to remember that it can take 14-21 days for gray leaf spot lesions to develop so that they are recognizable. Infections that took place several days prior to a fungicide application will continue to mature. Most of the commercially available fungicides for corn contain two components representing two classes and modes of action, often both a strobilurin and triazole. Strobilurin fungicides protect uninfected leaf tissue from new infections and triazole fungicides can provide curative activity by stopping early infections that have just begun. Treatments made during the dent (R5) substages are much less likely to provide a yield response than those made earlier. Although, overall yield, especially test weight, could be affected by disease during the dent stage when as much as 55% of dry matter (Table 1) is left to accumulate in kernels (Abendroth et al., 2011). Table 1. Dry matter accumulation, grain moisture, and growing degree days (GDD) during dent (R5) substages. *Grain moisture and dry matter variation of at least +/- 2% is expected during R5 substages. The fungus causing northern corn leaf blight (Figure 1b) is favored by the cooler temperatures that we are experiencing, especially in combination with higher humidity and dew. This disease will likely also continue to increase in susceptible hybrids during the last few weeks of the growing season. The same fungicide treatments recommended to manage gray leaf spot (above) in the late stages of corn development apply to northern corn leaf blight. Figure 4. 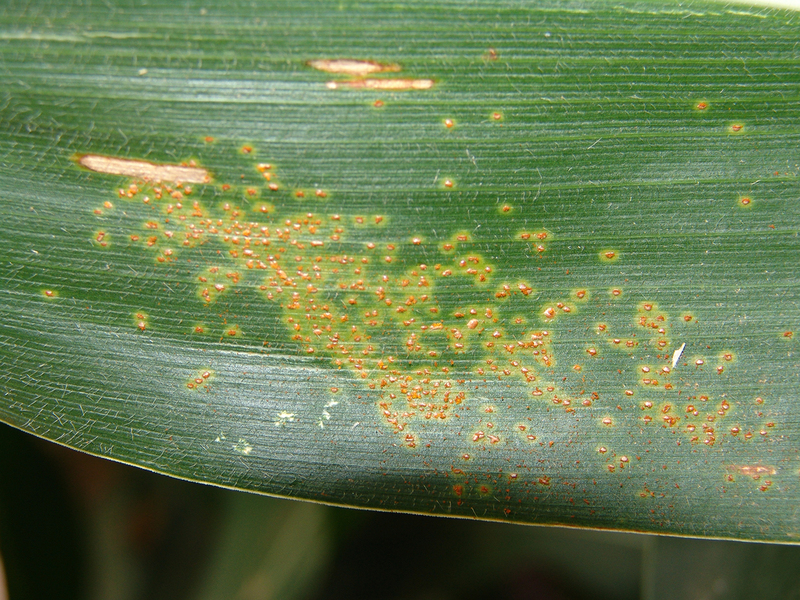 Southern rust pustules on a corn leaf. We continue to identify southern rust (Figure 3) in a few new locations in Nebraska and it is reported to be increasing somewhat in other areas. The cooler temperatures, especially night temperatures, will likely help to keep its severity less than expected, making southern rust less of a threat to Nebraska corn that has reached the dent stage (R5). 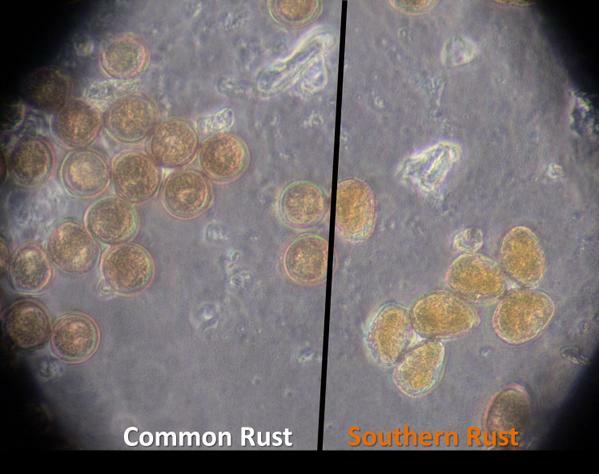 The confirmed distribution of southern rust can be observed on the IPM PiPE website. The most reliable method for identifying corn rust diseases (Figure 4) is based on examination of microscopic spore characteristics . This can be done quickly for samples submitted to the UNL Plant & Pest Diagnostic Clinic. 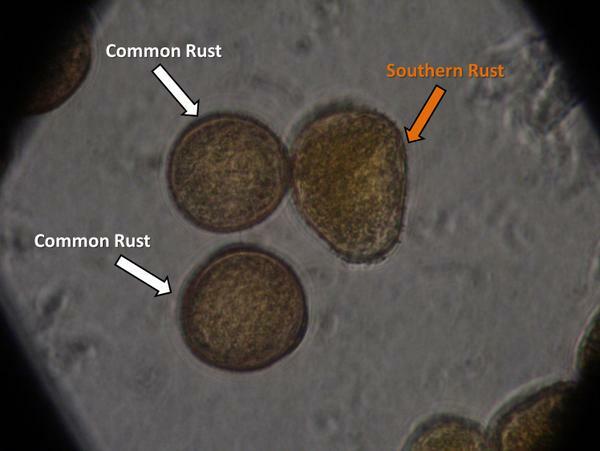 Southern rust spores are usually orange/tan in color, produced mostly on the top side of the leaf, and easily wiped off. They can easily be mistaken for similar looking diseases, especially common rust (Figure 4). A list of foliar fungicides labeled for use on corn in Nebraska and their characteristics are summarized in the 2015 Guide for Weed Management with Insecticides and Fungicides. Results from foliar fungicide trials conducted in Nebraska are available at the Crop Watch website . Other resources linked below are available to help identify diseases and track the Nebraska counties where southern rust has been confirmed. Mention or display of brand names is for identification purposes only. No endorsement or criticism is intended for those mentioned or any equivalent products not mentioned.